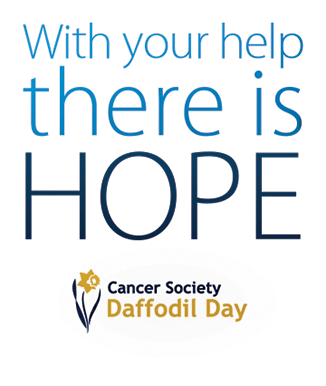 The Cancer Society of NZ Manawatu Centre (which includes Ōtaki) fundraiser and Daffodil Day co-ordinator Faye James says the most important message to give all those donating to the 2015 Daffodil Day appeal is that their contribution will definitely be spent in their community. All donations from our region will indeed go towards cancer services in our region. I believe it is imperative to the integrity of the Cancer Society that people understand that what they generously give is spent on services in their community. Cancer is the biggest challenge many of us will face in our lifetimes. Today 60 New Zealanders will receive a diagnosis of cancer. This August marks the 25th year of Daffodil Day and the very successful sponsorship of the ANZ Bank. Mrs James also emphasised that the Cancer Society relies entirely on the generosity of the public. It is solely the money received from the public that maintains the society’s myriad of services to those with cancer. The Cancer Society does not receive any direct Government funding. On Daffodil Day hundreds of volunteers will be on the street exchanging a daffodil for a donation in every town throughout Kapiti and Horowhenua.